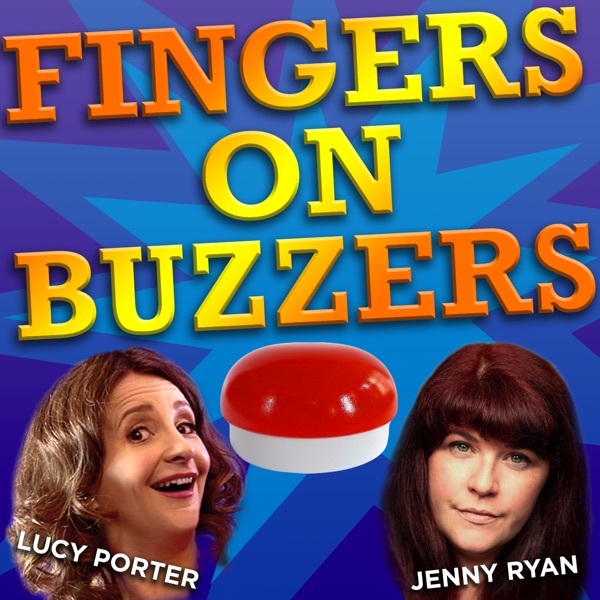 Fingers on Buzzers is brought to you by comedian and keen amateur quizzer Lucy Porter, alongside The Chase's very own Jenny Ryan. Whether you’re a Pointless armchair aficionado, nostalgic for the days of Going for Gold, or a bona fide Mastermind, this is the podcast for you. Jenny and Lucy speak to a host of people who work behind the scenes of our favourite TV quiz shows, including James Harkin (QI), Roger Tilling (the ‘Voice’ of University Challenge) and Jenny Hawker (Only Connect); plus we hear from epic winners and losers of quiz shows past and present, from Bullseye and Blockbusters to Britain's Brightest Family and everything in between. Lucy and Jenny will also discuss the BIG issues including the etiquette of pub quizzing, new quizzing technology and how questions have changed with the times. All the BIG questions will be asked (and answered.) What IS the difference between quiz shows and game shows? With the help of experts and enthusiasts alike, Jenny and Lucy get to the bottom of that and much, much more besides. There's also plenty of opportunities to play-along, as week-by-week Jenny coaches plucky layperson Lucy on the ‘quiz syllabus’, and in-turn Lucy tests the mettle of general knowledge guru Jenny with a weekly pop-quiz. Whether you're an Only Connect know-it-all, still dine-out on your Fifteen To One appearance from 1993, or only indulge in Trivial Pursuits on December 25th, this podcast is for you. 16 It's a Christmas Quiz-tacular! Lucy and Jenny are full of quiz-mas cheer in this seasonal extra episode and have a good old reminisce about the quiz-based board games that cause family feuds after the roast turkey. And there's also a festive themed quiz, so pour yourself a generous glass of port and play along at home. A very happy Christmas from everyone at Fingers On Buzzers - thank you so much for listening and we'll be back in early 2019! 15 Richard Herring's Pointless Reveries & Other Memorable Contestants. It's the end of term, so we thought we'd treat you to a slightly longer edition. A quiz show is nothing without it's contestant - celebrity or otherwise - so Lucy & Jenny talk about those who are remembered for all the right, but mostly all the wrong reasons. Comedy legend Richard Herring re-lives some of his quiz show appearances and injustices - he will always shudder whenever he hears 'Shaddup your face' - which is presumably often. Plus, Thomas De Bock takes us through the TV quiz show scene in Belgium. In this week's listener quiz - courtesy of Chris Walsh - Jenny & Lucy keep their buzzers a mystery... put your guesses as to what they might be in the comments below! So in short: Herring, Belgium, legendary contestants and Joe Dolce ... there's an awful lot of Joe Dolce for some reason. FOB is back for a Christmas special on Friday 21st December 2018! 14 Come and See What You Would Have Won. It's all about the 'merch'! If you have a Blockbuster's jacket, or drink your ale from a Bullseye tankard, then Lucy & Jenny want to hear from you! They also talk cash prizes with Ailsa Watson, who hit the jackpot on Fifteen-to-one and Lucy has her eyes on the prize of an appearance on Only Connect, when our hosts chat with Mike Turner - he writes the walls on the show. And listener Bernie sets a spectacular quiz, which sees our Lucy and Jenny go head-to-head on the subject of US presidents.... if you can 'Trump' that, then pop your questions in the comments below. 13 The Charlie Baker Money Maker & A Theme Of Themes. 12 Do You Want To Share, Or Shaft? And Other One-Series Quizzing Wonders. In this episode Jenny and Lucy discuss those unloved, discarded quiz shows which saw the smallest light of day, they also speak to TV exec Tamara Gilder, who as well as being behind some of telly's greatest hits, has also worked on some classic one-series-wonders. Fifteen-to-One is hardly a flash in the quizzing pan though and Paul Eastern regales with his tale of appearing on the show. And canny listener Nick Tozer pits our hosts head-to-head with a double themed quiz no less! Don't forget to put your quiz questions in the comments below! 11 Lucy's Unruly Buzzer & Someone Give Jenny An Award! On this week's episode Lucy & Jenny discuss quiz audiences and the difference between quizzing with and without them & TV Quiz warm-up stalwart Mark Olver gives a glimpse of how to work the crowd. Our quiz queens go head to head with another fabulous listener quiz (pop your questions in the comments below) and speak to David Lea of The Quiz League of London. 10 The Day Anne Robinson Met Barbra & An Impossible Fashion. In this episode, Lucy & Jenny discuss TV quiz sets through the ages and hear from broadcaster Tom Hourigan, whose appearance on The Weakest resulted in bright blue shirts selling-out across the country & presenter of Impossible, Rick Edwards says why he loves being at the helm of TVs most eccentric quiz. Leave a quiz question in the comments below and we'll put them to future guests! 09 Did Quizzing Change Your Life? And Bring Back Pop Quiz! In this week's episode, Jenny & Lucy discuss how quizzing has changed their lives and hear from someone whose quizzing resulted in marriage! Tell us how quizzing changed your lives in the comments below! 08 The Jeopardy Of Quizzing & Lucy Gets Commissioned! In this episode, Jenny and Lucy speak to Joel Hess about his Jeopardy appearance - it was a lifelong ambition, but did the experience live-up to it? Listener Josh pits our hosts against each other with his brilliant general knowledge quiz. Plus, we hear from TV show developer Daniel Nettleton, who is one of the brains behind TVs newest quiz 'Chase The Case' and it looks like Lucy can finally get her show; 'Cakey, Cakey, Dance-off' commissioned .... he said 'yes' so it's practically a verbal contract - and you are all the witnesses! 07 Kids TV Quiz SPECIAL! From Quizzing on Crackerack! To Britain's Brightest Kid. In this special episode, Jenny and Lucy look back to their first tentative steps into the world of general knowledge and it's apparent that our 'Vixen' has always had a touch of 'The Chaser' in her. Whilst Lucy is most keen to reunite with a winning quiz team of her youth- they got in the local paper you know! There's a look at kids TV quizzes past and present and we hear from former contestants of Britain's Brightest Kid, Ask The Family AND from one chap who won a rather disappointing prize after a quizzing appearance on Crackerjack! way back in 1968. Quiz isn’t just a mind sport, it’s a mind game – Lucy and Jenny discuss the psychology of quizzing. How do you prepare mentally and physically to succeed in your quizzing exploits? Can you drink and quiz? We chat to Jack Yeo, who has turned his obsession with TV quiz shows into a career behind the scenes in game show development – he tells us about that, and how his analysis of statistics means he knows the best tactics for contestants to take on The Chase. Our second guest is journalist Simon O’Hagan, who tells us about the challenges of setting the weekly quiz for the Independent magazine, the joy of finding great questions, and the art of writing an interesting and fun quiz. The Quiz Syllabus topics today are designed to really challenge each other on our weaker areas. Lucy poses some stumpers on Battles, while Jenny sets questions on Sporting Trophies. Music by: Justin Edwards & Kevin MacLeod (Happy, Happy Game Show), Mad Moments Go (The Winner). 05 Come & See What You Would've Won! Lucy and Jenny discuss how the quiz world is becoming more ‘woke’ – why should so many questions be about dead white men? University Challenge have recently been making efforts to redress the balance with more questions about women and figures from BAME history, but is this enough? Is quiz classist? Join in the debate over at our Facebook page. We also chat with Julia Hobbs, question producer on The Chase, for an insight into how a question goes from the writer’s brain to our TV screens. The Quiz Syllabus gets tough this week, with two topics that always come up in quizzes, but that we don’t remember much about between us – Traditional Anniversary Gifts, and Dukedoms. Spoiler alert - we don’t do very well. Music by: Justin Edwards & Kevin MacLeod (Happy, Happy Game Show). 04 Help, I'm a Serial Quizzer and Some Rappers Delight. Technology has had positive and negative effects on the world of quiz, so Lucy and Jenny dig into that thorny topic. Whatever happened to Bamber Boozler? Have Lucy’s children been hypnotised by HQ’s Sharon Carpenter? Let’s find out. Guests on this episode are notorious ‘serial quizzer’ Jon Stitcher talking us through his compulsion to quiz on telly, and Quiz Queen Jane Allen, founder member of the International Quizzing Association, who chats with us about the quiz scene across the world, from Croatia to India. On the Quiz Syllabus, Lucy challenges Jenny on vexillology with questions on Flags of the World, and Lucy is tested in turn on Rappers’ Real Names. Which flags contain the colour purple? What are our Wu Tang Clan names? Tune in and find out! The discussion topic for hosts Lucy Porter and Jenny Ryan this week is one most listeners are familiar with – the pub quiz! We discuss memories of pub quizzing, tactics for success (who knew Lucy was so competitive?) and start a search for the best pub quizzes around. Got a recommendation for a great pub quiz? Get in touch on Twitter or Facebook. No let-up in the quest to become better quizzers, as the Quiz Syllabus takes us through Nautical Terms and US State Capitals. Oof! Thank you to our guests: Jenny Hawker of Only Connect, and Brendan Curtis. Your hosts Lucy Porter and Jenny Ryan have a hot discussion topic this week: quiz show hosts. What makes a great quiz show host? Who are the best examples, and what makes them shine? Our guests are serial quiz show contestant James MacGregor, who joins us to talk about his team’s appearance on Eggheads, and James Harkin, star of the hit podcast No Such Thing As A Fish, senior QI Elf and all-round fact magnet. We press on with the Quiz Syllabus – Lucy has all the answers with her quiz on Heraldry, and Jenny sets some testing questions on UK Christmas Number Ones. Very festive! 01 - Roger Tilling’s Milking Stool & A Blockbusters Epic Fail. In today’s episode, your hosts Lucy Porter and Jenny Ryan discuss what the difference is between a game show and a quiz show. What defines a quiz show? Could it be evening dress and pipe-smoking? Do cargo nets make it a game not a quiz? Join in the discussion on our Facebook page. Our second guest, giving us a glimpse behind the curtain of quiz show production, is Roger Tilling aka the Voice of University Challenge. Roger shares with us some behind-the-scenes tidbits and tells us about his biggest pronunciation challenges – all in those inimitable mellifluous tones. And Lucy and Jenny will start to work their way through the Quiz Syllabus, testing each other on those topics which, with a bit of attention, will make you a better quizzer. Every episode will feature mini-quizzes on two topics - listen out at the end of the show for next week’s subjects so you can get some revision in! This week, Lucy sets Jenny a champagne cork-popping pop quiz on Wine Bottle Sizes, and Jenny attempts to ease Lucy in with a warm-up set of questions on British Comedians. Fingers On Buzzers - The Trailer. Episodes from Sept 14th 2018.